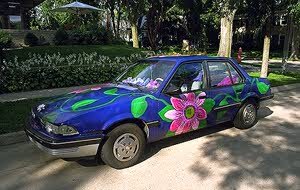 Creating an art car usually begins with a burning desire to share something with the world. Whether that something is a passion, a cause, or just a wild idea, people everywhere are discovering that their cars make excellent canvases! "Purple Passion" was created in Minneapolis, Minnesota where a good part of the year is dreary and cold. 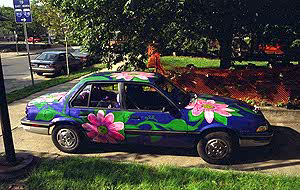 Since painted cars are the easiest to maintain in such a harsh climate, the car would last longest if painted. And, why not add a vibrant color to another wise bland winter landscape. This car had to be painted purple. 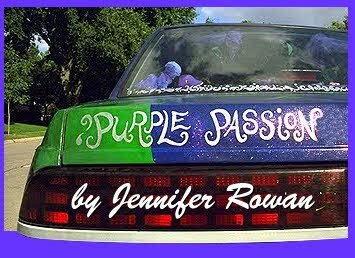 "Purple Passion" began as an expression of artist Jennifer Rowan's true love for the color purple... all things purple. Needless to say, purple is an integral part of this car. The outside is painted purple with a bluish tint while the inside is filled with a multitude of purple plastic objects and lots and lots of purple stuffed toys. Passion flowers are also an important element of the design. They are, of course, purple... but also serve as a daily reminder of the beauty of flowers - especially in a climate where flowers are scarce during much of the year.